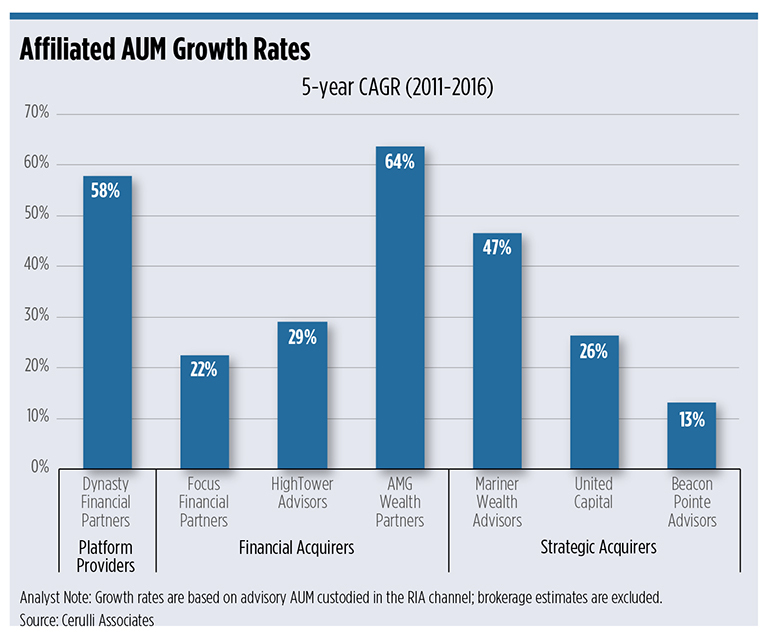 The registered investment advisory channel is “ripe” for consolidation, and a short list of firms capitalizing on the market environment have experienced tremendous growth in the last five years. From 2011 to 2016, three major consolidators—Dynasty Financial Partners, AMG Wealth Partners and Mariner Wealth Advisors—grew their affiliated assets under management by a compound annual growth rate of more than 45 percent, according to a new report by Cerulli Associates. In that same period, all independent RIAs grew by only 11.7 percent CAGR and hybrid RIAs by 10.7 percent. There are now 18,225 retail-focused RIAs, up 17.5 percent from 15,522 in 2012, according to a recently published report by Cerulli, and that rapid growth in the channel has fragmented it and created opportunity for established RIAs, broker/dealers and private equity firms. The national and regional b/ds are growing at a faster clip than the RIA channel, but some consolidating firms have proven attractive to advisors and are becoming a formidable threat to b/ds, Cerulli says. Highly publicized firms HighTower Advisors and Focus Financial Partners had five-year compound annual growth rates of 29 percent and 22 percent, respectively. Cerulli points out that while these firms have not yet announced initial public offerings, they're poised for future growth. And they have attracted the attention of private equity firms. In October, Thomas H. Lee Partners purchased a significant stake in HighTower, which oversees about $50 billion in clients assets. Last April, Focus announced that private equity firms Stone Point Capital and KKR would acquire about a 70 percent stake in the firm, valuing the company at about $2 billion. The Cerulli Associates report, “U.S. RIA Aggregators’ and Platforms’ Mounting Momentum,” divided consolidators into three segments: platforms, financial acquirers and strategic acquirers. Platforms, defined as those that allow RIAs to “rent” an end-to-end operating and support platform and do not take an equity stake, include affiliation options with Dynasty Financial Partners and HighTower’s Network. Financial acquirers, such as Focus Financial and AMG Wealth Partners, acquire and aggregate RIAs and realize financial gains through a liquidity event or cash flow distributions. United Capital and Mariner Wealth Advisors fit in the strategic acquirer category, according to the report, because they are large RIAs that acquire firms to grow market share with the intention of achieving other growth-oriented strategic objectives. The segment an advisor or firm chooses to partner with is based largely on need and preference, the report said.